Wat Benjamabophit or the Marble Temple, built by King Rama V in 1899 during the construction of Dusit Garden, is one of the most beautiful temples in Bangkok. 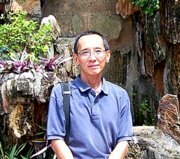 The temple is just a few hundred metres from Dusit Garden, the palace complex constructed by King Rama V in 1900. King Rama V built this temple in 1899, hence the name benjama-bophit which means the fifth king. 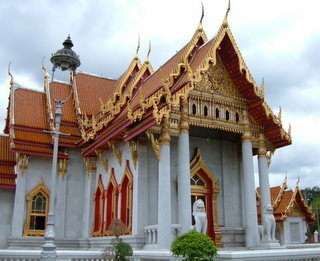 It was built near Dusit Garden to replace two older temples pulled down to construct the new palace. Please map to the Marble Temple. The visitor on entering the main gate is struck by the dazzling sight of the ubosot or ordination hall made from white Italian polished marble slabs, the famous Carrara marble, from Italy which gave the temple the name, the Marble Temple. The ubosot is an elongated building with glazed roof tiles, multi-tiered gables with gold eaves and bird-like chofahs protruding from the ends of the roof. Terraced roofs with gold edged gables descend from both sides of the ubosot. The grand main entrance to the ubosot is framed in elaborate gold designs and flanked by pillars. The windows are framed by gold carvings, in striking contrast to the sparkling white marble walls. The ashes of King Rama V are stored at the base of the main Buddha statue on the altar of the Marble Temple. A canal, spanned by two old wrought iron bridges, separates the main temple compound from the other part of the temple grounds where the monks' living quarters are located. Visitors can be seen feeding the huge striped catfish swimming in the canal. Within the southern compound, near the eastern temple wall is the Phra Tenang Song Dharm or Royal Recitation Hall, used by King Rama V for recitation of the Buddhist scriptures on holy days. Behind this hall is the building, which King Rama V lived in when he was ordained as a monk in 1893. 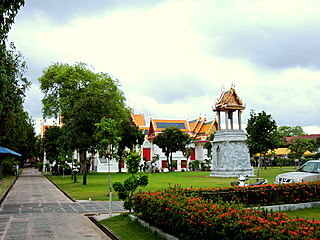 Originally in the Grand Palace, it was reconstructed on the grounds of Wat Benjamabophit during the construction of the wat from 1900 – 1905. An old bell tower stands in the middle of a huge lawn beyond which are the viharn or sermon hall and the temple foundation building. The temple grounds are neatly kept with beautiful flowers and the buildings, in matching décor, are well laid out and maintained. 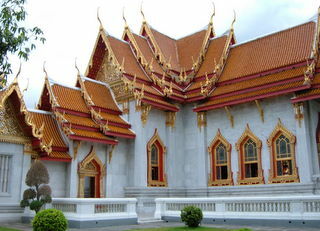 Wat Benjamabophit, with the Marble Temple as the centerpiece, is one of the most beautiful temples in Bangkok, a royal legacy of King Rama V.
The temple is in Nakhon Pathom Road, off Phisanulok Road where Government House is located. Get off at the bus stop near Government House. Admission to the grounds of the temple is 20 baht. If you are an independent traveller, here's a handy e-guide book, Tour Bangkok Legacies, which will help you along as you explore the streets of Bangkok and discover its old treasures. It's complete with historical descriptions, maps and detailed directions on how to get to these places.